I am happy to support our patients as they accomplish good dental health, and truly enjoy building long-lasting relationships with each of them. 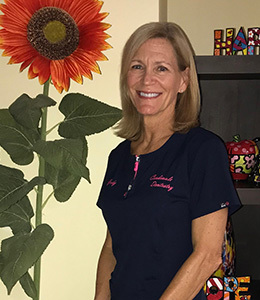 I have been part of the dental field since 1994, have taken many continuing professional education courses, and joined Cardinale Dentistry in 2014. Here I work directly with Dr. Cardinale, our staff, and our patients to accomplish the vision of the practice. We have an amazing team, with everyone striving to do and be their personal best, so our patients have wonderful visits. I have been married for almost 30 years to my Army veteran, the love of my life, my husband Dylan. We have a son and two doggies, Indy and Bella. Dylan and I enjoy biking and playing volleyball. I like spending time with our patients, building strong, trustworthy, and caring relationships with each of them. 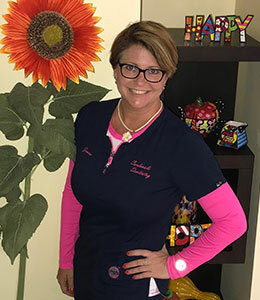 I’m somewhat new to the dental field, having joined Cardinale Dentistry in 2017. I answer the phones, call insurance companies, keep up with patient recare, check patients in and out, and provide the best customer service possible. It’s fulfilling to work with people who are honest, fair, encouraging, helpful, knowledgeable, friendly, and patient. I never feel embarrassed to ask questions; they always encourage questions to be asked in order to grow and learn! In March 2018 I married the best man ever! We have a healthy and happy 75-pound bulldog, Haus. I love the water, so spending time at the pool or beach is what I like to do with my free time. The best part of my job is coming into the office and working alongside such fun and caring people every day. Not a day goes by without laughter and learning something new! I’m here at Cardinale Dentistry to complete my internship. You can find me working alongside our hygienists and taking care of set-up, sterilization, and X-rays. Occasionally, I’ll also assist the doctors with exams. I feel fortunate to be gaining experience with such a professional group of people. Everyone is extremely patient, excited to teach, and willing to help each other no matter the circumstance. I have been involved in the hospitality field for five years and look forward to my new career in dentistry. At home, I have two cats, Charlie and Melly. I love cooking and doing yoga. My favorite thing to do on a hot day is go to the beach to play volleyball. I really enjoy the people aspect of my work. I learn a lot from our patients, as they share their stories and experiences, which in turn helps them feel at ease and comfortable. My dental field experience started in 1999, in Rochester, New York. 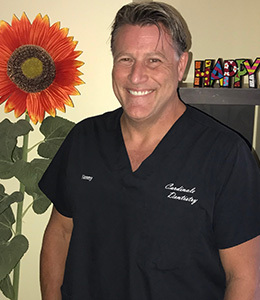 In 2017 I joined Cardinale Dentistry, where I work chairside, and assist the doctor during procedures. 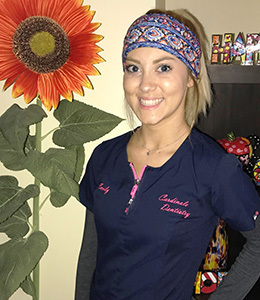 I also handle patient computer charting, fabrication of temporary teeth, and lab work; and educate our patients about oral hygiene. This is an amazing office, where our patients’ comfort and needs come first. Our doctors and team provide the best care, using the latest technology. I like to be on the go and have a busy life. I prefer to be outdoors, any chance I can find, and love spending quality time with my family and friends. 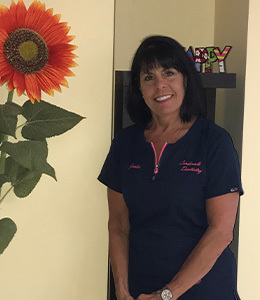 What I love most about working at Cardinale Dentistry are our patients: They are truly a joy to work with, and there’s nothing I strive for more than making them feel like a part of our family. 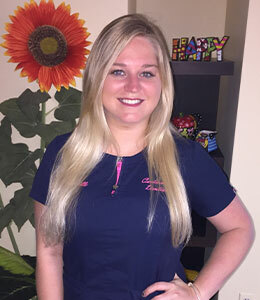 I joined Cardinale Dentistry in 2013 and have enjoyed working in the dental field since 1987. I help provide our patients with the beautiful smile and ideal dental health they’ve always wanted. Children, adults, and seniors appreciate my understanding, kind, and gentle demeanor. No questions regarding your preventive dental health will go unanswered. I take great pride in giving each patient individualized care during regular checkups and cleanings. And, in addition to polishing your teeth and examining the health of your gums, I will also give you all the information you need to keep your pearly whites and gums healthy between your visits to our office. An Illinois native, I grew up in Guam and Maui, Hawaii and graduated from Missouri Southern State University. I love being around people, and we have some of the most wonderful patients. Just seeing them smile, and knowing they had a great experience, is truly rewarding! I’ve worked in the dental field since 1994, starting as a dental assistant and then transitioning to the front desk. 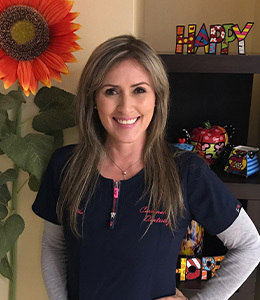 In 2006, I found my professional home and family at Cardinale Dentistry, where I answer the phones, schedule appointments, check patients in and out, and submit insurance claims. Coming to our office doesn’t feel like work to me: everyone is part of my family and the laughter and smiles throughout the office say it all! I was born in Naples and have always lived in Bonita Springs. I have two beautiful children, Jayden and Cage. We love going to the beach, watching our fabulous sunsets, playing volleyball, and hanging out with family and friends. I have a Welsh Terrier, too. Her name is Belle and even though she is getting older she still plays like a puppy. I find a lot of personal and professional satisfaction in working together with my patients to help them achieve good, long-term oral health. 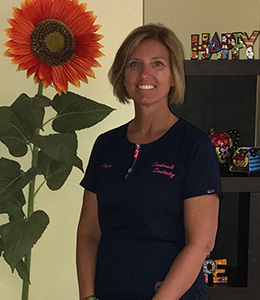 I started in the dental field in 1981, am a registered/licensed dental hygienist, and graduated from Indiana University. In 2013, I joined this amazing practice, where I offer gentle prophys (cleanings), scaling and root planing, perio charting and evaluation, and lots of patient education. At Cardinale Dentistry, we are all caring individuals who work as a team to make our patients feel welcome. We each strive to deliver the best dental care and experience possible. My husband and I have two sons, two amazing daughters-in-law, and three delightful grandchildren. In my spare time, I love to travel with family and friends and enjoy reading and bike riding, too. I have two sons. One lives here in Naples and has a wife and daughter, so I am a grandfather now! I love to work on and restore old cars and motorcycles. I also enjoy the outdoors, especially boating and going to the beach. As a dental assistant, I enjoy taking care of our patients and their dental needs chairside. 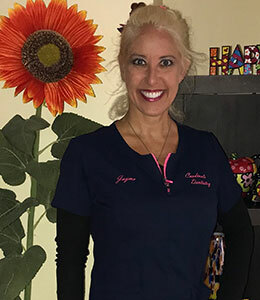 When I am not assisting the doctors, I can be found taking X-rays and digital impressions, as well as performing lab procedures and sterilization of dental tools. Whether sitting chairside or helping in any way I can behind the scenes, my commitment to our patients’ comfort is paramount. My purpose is to ensure our patients’ dental needs are met with excellence in a comfortable, caring environment. I enjoy being a part of such a hardworking team and love making people happy. The best part about my job is feeling satisfied with our work when patients are happy with the final result. A native of Colombia, I enjoy spending time with my teenage daughter and playing volleyball.